Inertia and brake (open loop) dynamometer systems for inexpensive DIY dyno construction or upgrading of existing dyno's. Your very own dyno's in easy reach! Weather station for 'stand alone' track tuning or as DYNertia3 interface. 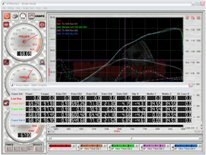 Comes with viewing and recording software or with a DYNertia3 system it automatically corrects dyno data. Accessories for DYNertia3 or for general data logging. CamView software for machinist, centre and edge finding with a webcam.